The big veggie garden is associated with the neighbor's garden. It's all his property, with fallow and alfalfa hay fields beyond. Each year, he has the tractor guy till at least once in the spring. Springtime, there is about an acre of bare ground that we divide and share. There is no difference between the square feet to be easily seen from north to south, east to west. Tilled dirt. By late summer, I can stop on a garden path and reflect on all that has gone on within one step, in any direction. I could be stopping behind some plants taller than I am. I could be standing beside little plants at my feet that represent hours of my activity. I have a sense of partnership, of belonging. 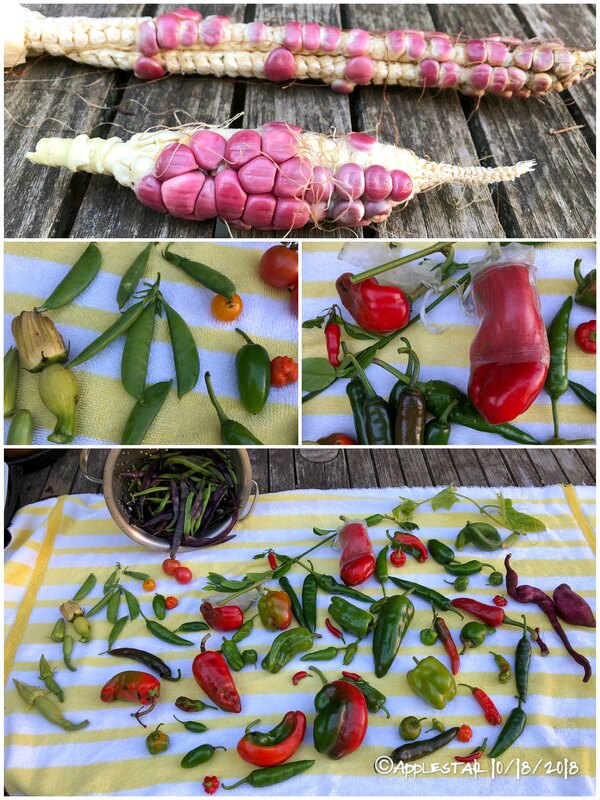 ...in spite of the unfavorable location and neglect and squirrels two of the Pink and Purple Mexican corn managed to completely mature, with dried out husks, and yielded enough for me to save for seed corn. Are they acclimating to this region and imparting earlier maturing trait to their offspring? I guess we will find out next year. ...I had decided a while ago that I was tired of harvesting beans, so stopped conscientiously picking them, expecting the vines to quit making any more and start maturing them. Um... what? 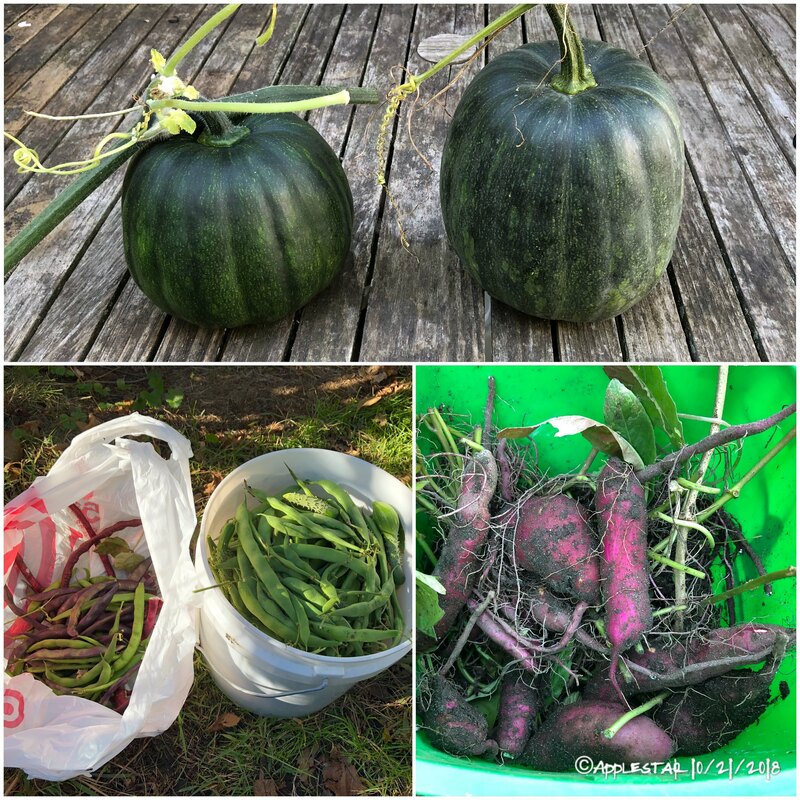 I ended up with nearly full 2-gallon bucket of beans from the VGB TRELLIS. The plastic bag contains more beans from the Red Noodle beans, Blue Coco beans, and the two green beans that I can’t remember the names of atm from the Sunflower House bed and the Haybale Row bed. I also dug up the sweet potatoes. 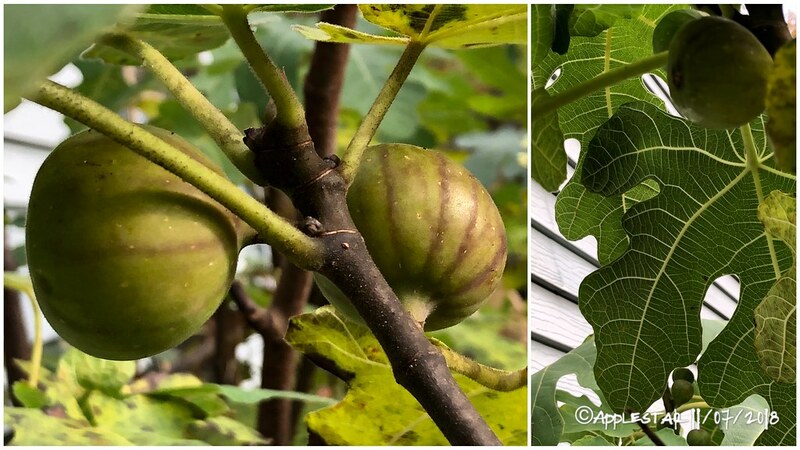 They grew well but had been defoliate by the groundHOG during the last month or so when I think they would have been fattening up the tubers. 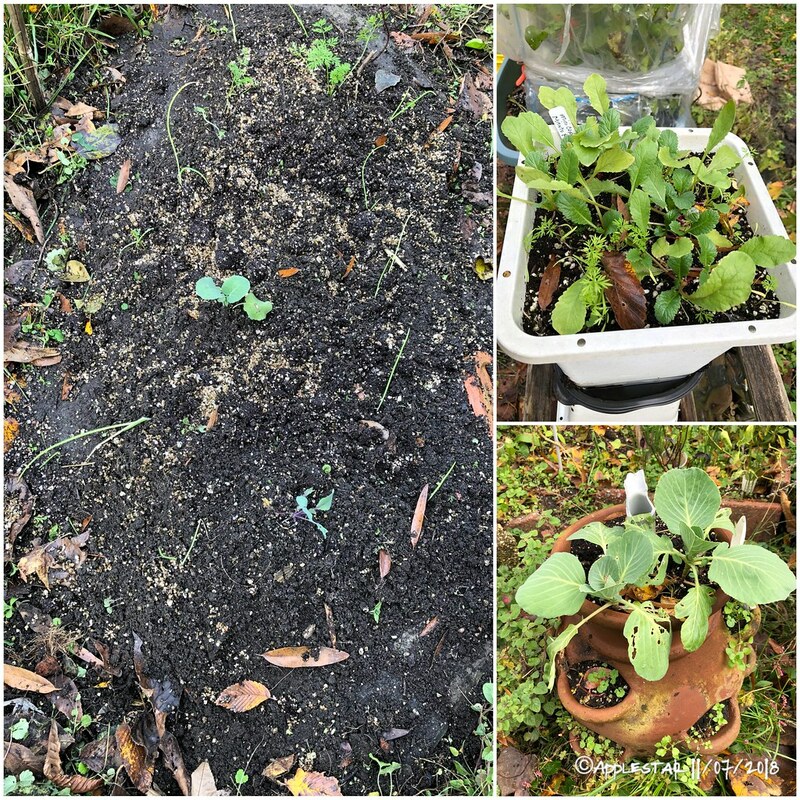 I may give sweet potatoes just one more try next year — planting ONLY the early maturing varieties like Georgia Jet , Porto Rico, Beauregard... I think another one is Carolina Ruby. I’m not sure I will like them though.... I really prefer the dry sweet flesh varieties. 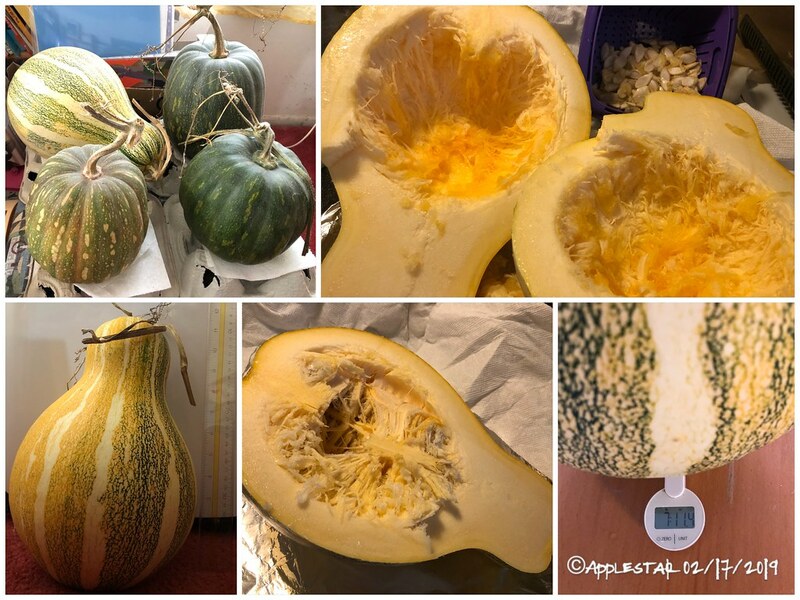 But I may have to concentrate on trialing sweet dessert type C. moschata winter squash, which when all is said and done, yield more to harvest for the amount of space they take up. 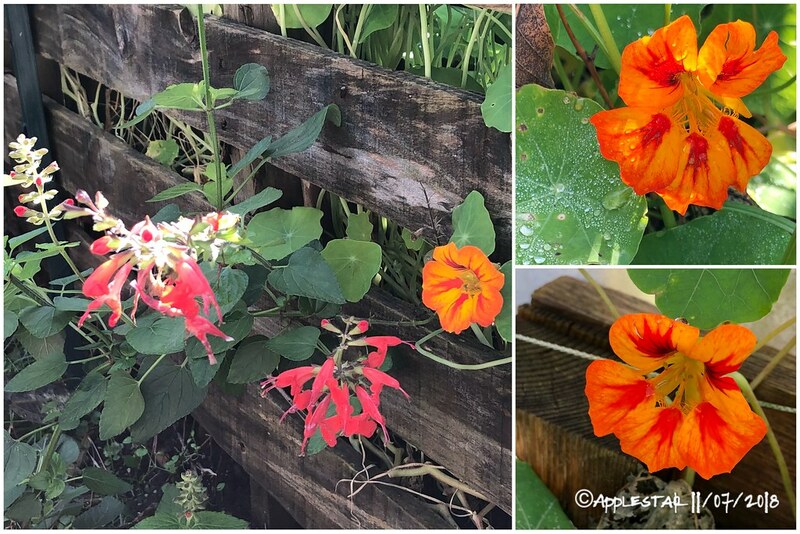 ...I didn’t take pictures, but I also harvested some nasturtium leaves and flowers, and harvested whole calendula plants for making tincture... aaaand I just remembered I should have harvested echinacea plants, too. Darn. I will just gave to dig up some roots later. I was amazed at how long those red noodle beans kept producing, despite the cold, as they really like heat! I finally pulled mine, too, along with the squash vines - have almost 4 cans full of lawn trash, which is mostly those. Got a good number of squash blossoms, while doing that! What variety of moschata are you referring to? How much do you get per plant? Is it so sweet that you can only use it for desserts? 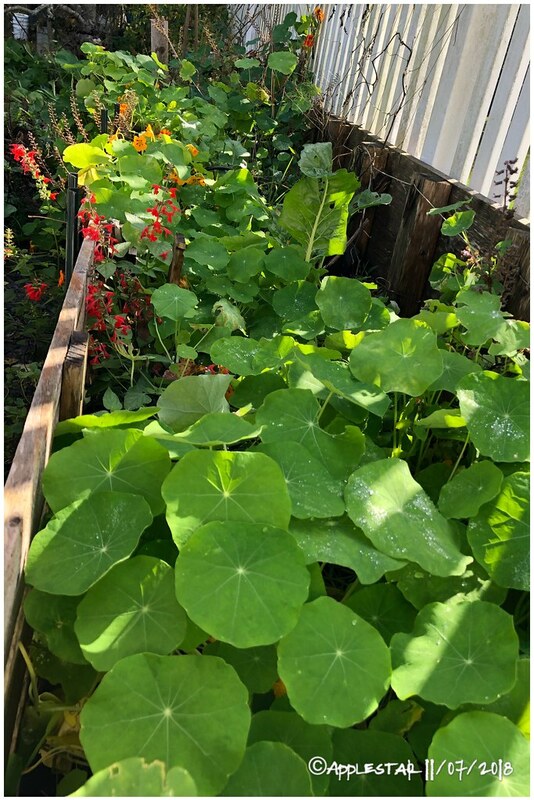 This variety of butternut that I grow - Polaris - gets huge vines (just 2 filled an area of about 4' x 30', and I kept training it back into the area. I got 17 squash from those two, plus 2 unripe, but large ones I got today, which I'll use first. Wow that Polaris butternut sounds really productive! ...I want to stick with OP varieties though... I might try South Anna Butternut listed at Southern Exposure Seed Exchange. I tried Nutterbutter this year. 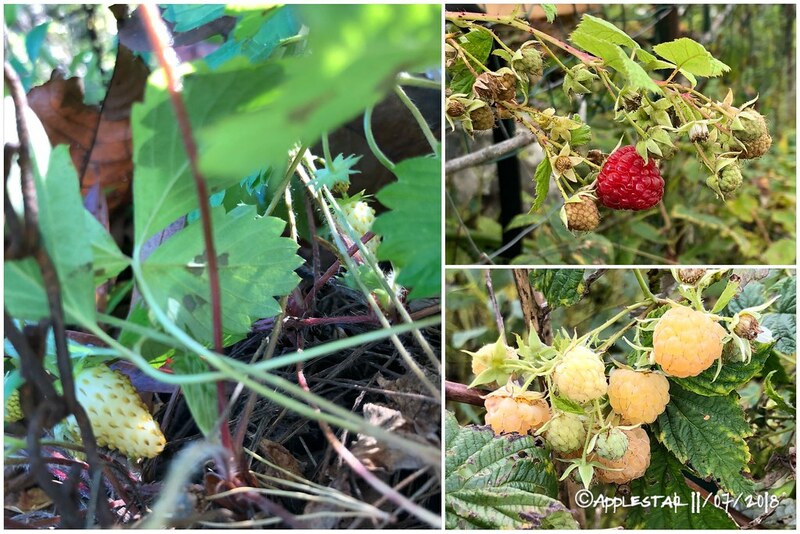 The fruits turned out smaller than I expected — half as big as last year’s — but maybe this was gardener error. 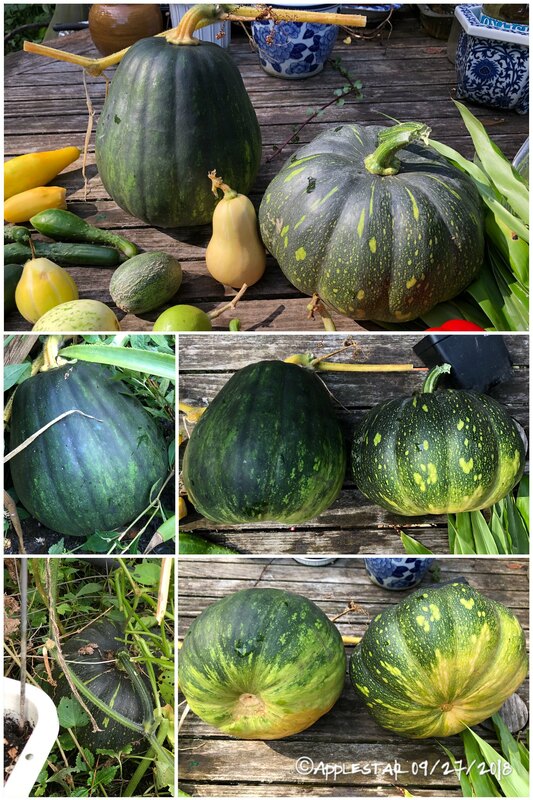 I’m still playing with my Thai Kang Kob x Seminole cross and pursuing the tall pumpkin-shaped segregate — you can see two example of this year’s grow out in the photo above— but I would like to try growing Tahitian Melon, even though that one is a 120 day squash. Another one I want to try is Long Island Cheese. I was trying to grow Upperground Sweet Potato this season, but accidentally got the Thelma Sander’s instead. Oh I grew Greek Sweet Red this year, but it only just started to bloom. I had to go on a last-minute shopping spree for a family event this morning, and as I was trying to hurry inside with my purchases, I noticed that the saffron crocuses in the front porch-side bed have BEEN blooming. At lease one of the flowers had been beaten down to the ground by last night’s rain. They never seem to bloom until after first few frosts, and they always catch me unprepared. I cleaned up the garden a little more, removing dead plants (curtting at soil level) and pulling up the stakes and supports to stack or collect for winter storage. 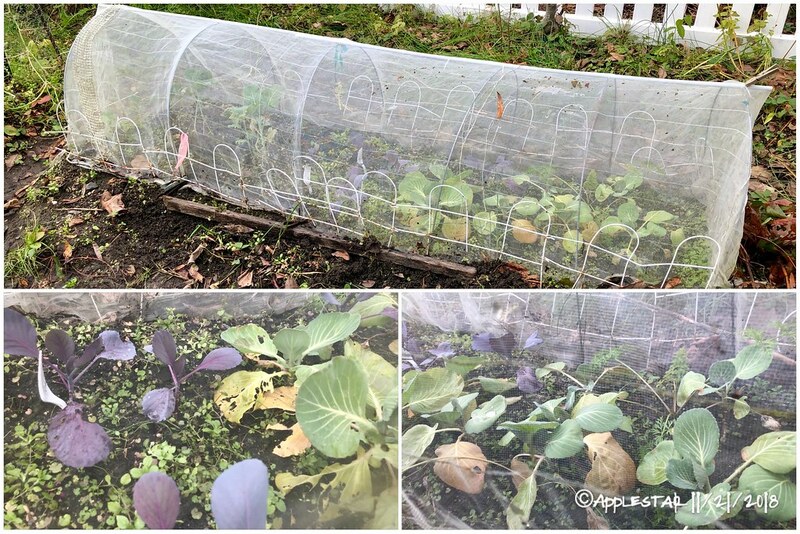 ...Today, I finally got around to planting the onions and a lone brassica that was still in the seedling tray. 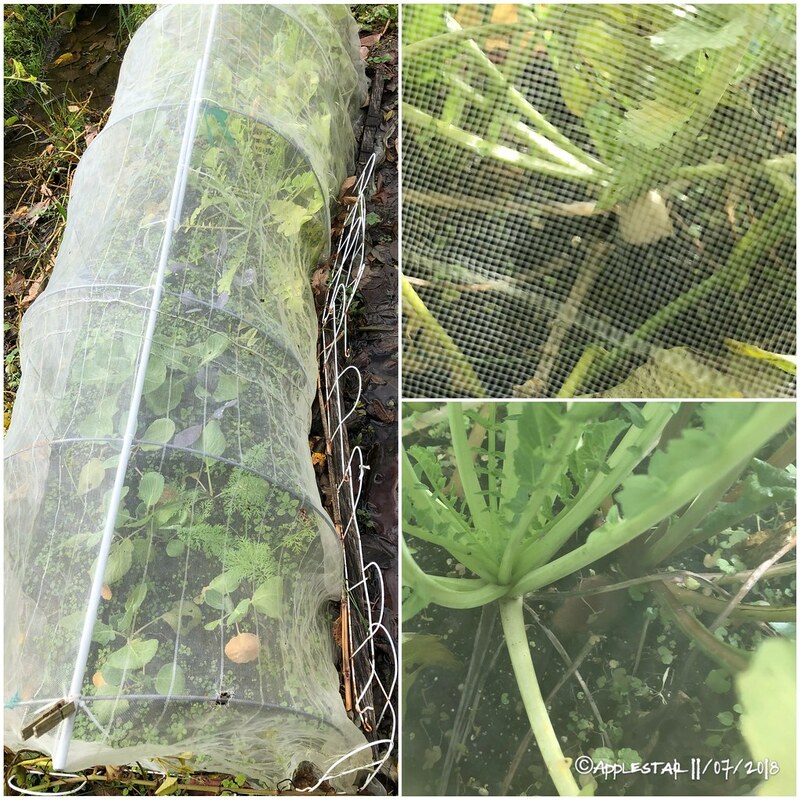 I still have this row of brassicas and daikon growing, though they are still small. Can you see the pink variety? 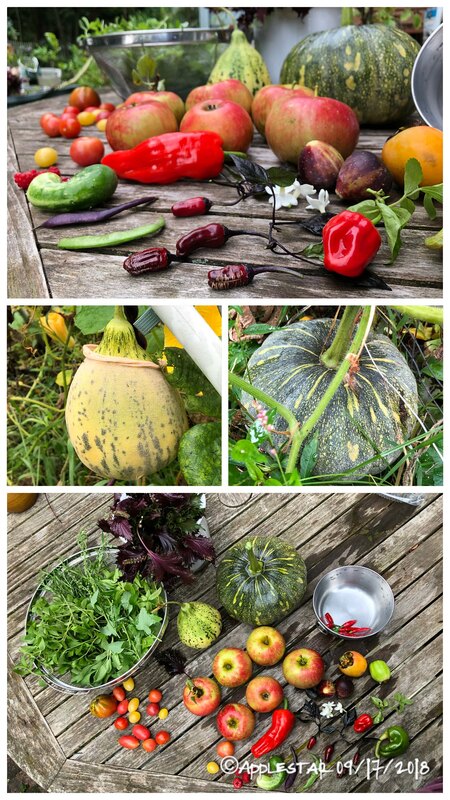 — I have to remember to harvest these before hard frost regardless of how big they are. 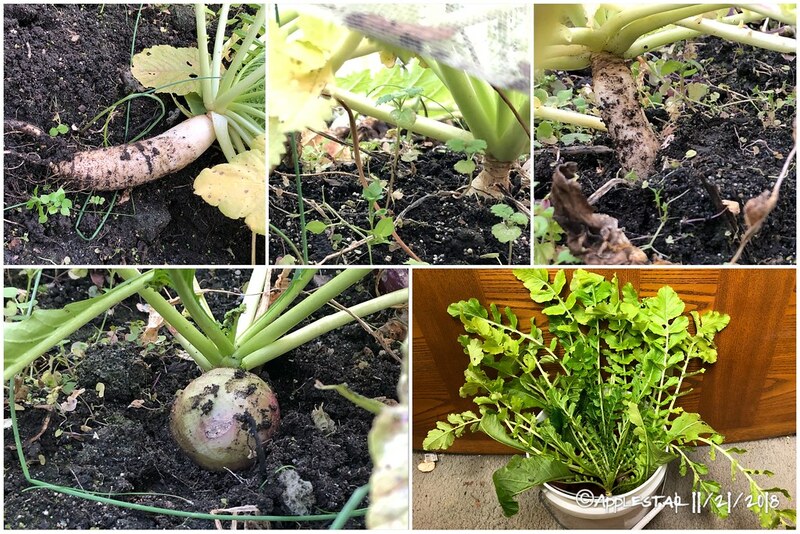 - pulled/harvested all the daikon and Korean radish — they were small, with biggest being about 2” diameter... could be I planted them late... or the exctra cold and short fall this year. These kinds of temperatures are not normally here for another month. Some nice radish tops/greens that I will be able to make use of though. - dug up the last rosemary and also the Korean Guchugaru Yong Gochu looked possibly still alive — potted them up. Also brought inside the seed grown pomegranates as well as some orange mint cuttings and chocolate mint cuttings. - moved two container strawberries closer to the house to hopefully keep them alive. 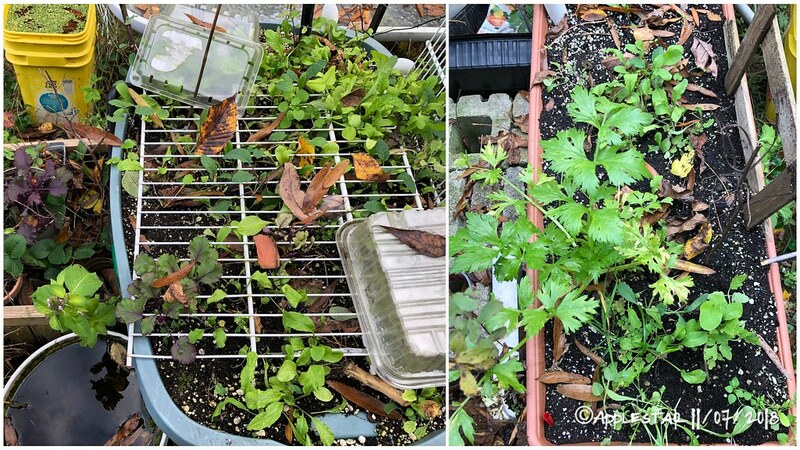 - pulled the covers off the patio pepper sip and another patio sip — those look shot — and used them to cover up the vermicomposter bin and the greens sips. They may or may not make it past the dip into low teens. - emptied most of the buckets and one rain barrel that had water in them. Left one bucket that had a goldfish in it. It might survive... it might not. 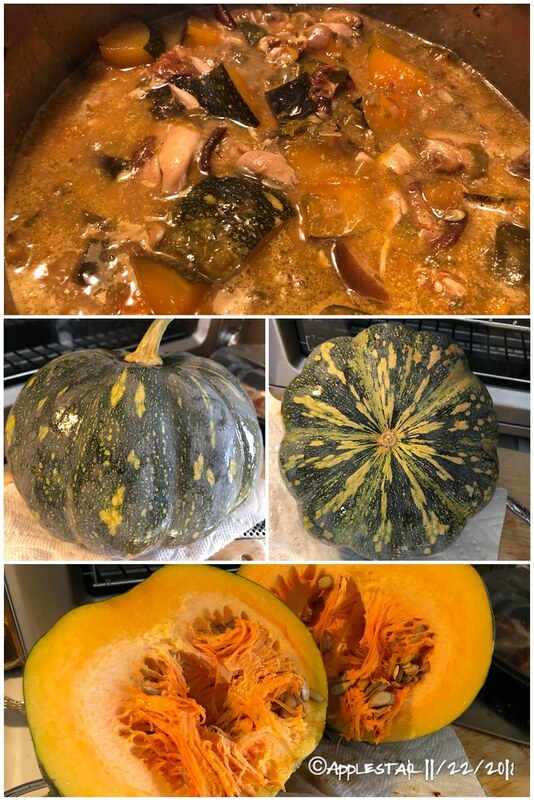 I made a winter squash stew today from one of the flattened shaped Thai Kang Kob cross. I started with the daikon and turnip greens from yesterday — chopped finely into 1/4” segments, they became very tender after initial sweating down with lacto-fermented myoga and garlic preserved in sake, onions and yielded superb flavor. I also added last of my own dried shiitake as well as broth from dried kombu (kelp) and sake (rice wine) — all great sources of umami — and used wings and legs of roast chicken for additional flavor and meat, then added tahini and potato starch/rice milk slurry to thicken. For additional texture and nutty flavor interest, I added hulless pepitos and walnut pieces. Some of the Arkansas Black apples are starting to come in — these apples are going straight into the fridge to mellow out and develop flavors until next month. The blemished ones are already ripe enough for good eating as fresh spicy/tart apples or for baking. ...I wonder if the difference in the size of the blossom-end scar means anything? 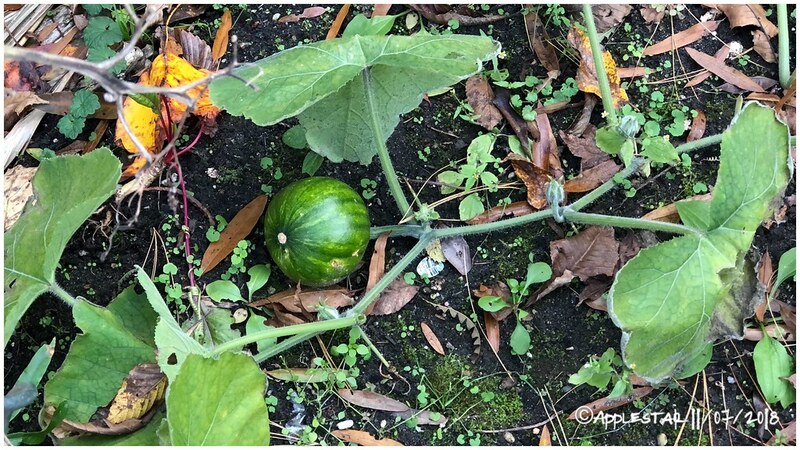 I’ve been worried about the Mrs. Aquillard’s Striped Cushaw for about a month now, — I posted about harvesting it on Sept, 7 (p.15). So I finally cut it open and roasted it to start eating it. As soon as it was done roasting, I made this with a part of the flesh. Since I didn’t have ground pork handy — and here comes my sometimes random leap — I cut up my leftover half of a mushroom, sweet red pepper, onion steak sandwich on a 16 inch roll (so 8” portion) into 1/2” cubes, then quickly sautéed with the onions in butter. Instead of soy sauce, I used salted koji. Oh and I added some toasted sesame oil and virgin coconut oil to the EVOO. The croquettes turned out great! 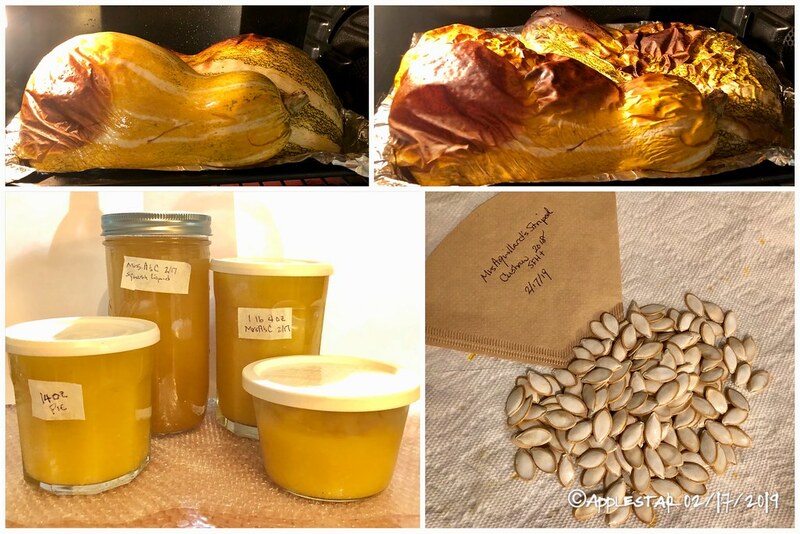 My Mrs. Aquillard’s was a mild and somewhat watery squash, but I followed the instructions to dredge in plenty of flour (I used white whole wheat) if using watery squash. Because I had included the sandwich bread, the filling turned into something like a savory bread pudding, creating a creamy mouthfeel, and the bits of presumably beef round slices and mushrooms added satisfying texture. I had mine with BBQ sauce #6 from the local BBQ place and a bit of lemon juice... with a side of blue cheese dip leftover from a take-out buffalo wings. DD had hers with mayonnaise, and DH had his with ketchup and pickles. ...Later, I separated the flesh from the skin with a gravy ladle (for some reason, that shape was perfect for this job), drained the liquid a bit, then puréed in the blender. It was still a bit too wet, tending to pool liquid, so I moderately strained it in a small mesh strainer, then saved the results separately. 14 oz was measured out to use in a pie recipe. I’m envisioning using the liquid and some of the purée to adapt and use in a peanut soup recipe.